Its Sunday morning and I'm not feeling particularly motivated to share anything complex, but I can't come up with an excuse not to share this incredibly simple and delicious "salsa" with you. I love fresh salsa. I'll happily chop away at fresh tomatoes and onions to whip up a batch rather than buying the smoother stuff in a jar, the flavor is just so much better and I love the chunky texture! Still, I wanted to do something a little different and when I came across some fresh tomatillos in our market I knew I would be able to give this recipe from an old Real Simple magazine a try. I love the simplicity of this recipe and the combination of the tomatillos and avocado. You could easily serve this chunkier but I really liked zipping it up a little bit in the food processor so it was the consistency of a chunky relish. Give it a try at your next outdoor party or when you're serving up a Mexican-inspired meal like my Slow-Cooker Chicken Carnitas! Make sure to peel the husks off the tomatillos and rinse really well before roughly chopping them. They're a member of the gooseberry family and can be very sticky unless they're rinsed well. Pitt and peel the avocado and chop it in quarters. Add the tomatillos, avocado pieces, jalapeno, onion, 2 tbsp. lime juice, coriander and a generous sprinkle of salt and pepper to the bowl of a food processor. Just pulse a few times until the consistency is like a chunky relish. 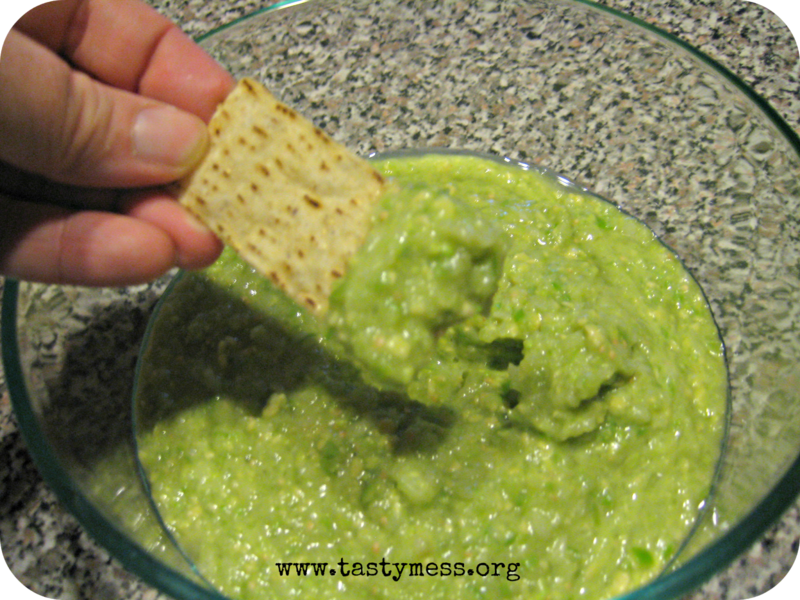 Enjoy with tortilla chips or add it to your favorite taco or burrito as a topping.